Director of Yoga Education Kawai Purapura Yoga Retreat, Albany, Auckland City. Lead Tutor, Wellpark College Diploma of Yoga, Albany, Auckland City. Pragyadhara means ‘The flow of wisdom.’ Flow is dynamic, fluid, innovative and adaptable. Wisdom is inner knowing, an awakened intuition that is forged through a synthesis of experience, knowledge, understanding and love. My name was given to me by my guru swami Niranjanananda Saraswati and its meaning represents a lifelong aspiration. The yogic process is a beautiful journey to enrich all facets of our life. As a holistic science it can be used to heal, develop and eventually transform oneself to experience one’s fullest potential. Initially people come to yoga to heal or fix something because their is a need to fulfill. This maybe the only reason people engage with yoga and that’s okay. There is also scope for self development where the entire personality is enhanced and as a result the quality of life naturally improves. Beyond this there are spiritual aims which represents the ultimate goal of yoga as an evolutionary technology. Yoga is widely recognized as incredibly effective for releasing tension, inducing deep relaxation, and slowing down a busy mind, but it doesn’t end there. It is also very helpful and proven to release mental and emotional suffering. It is possible by cultivating awareness through the techniques of yoga, to develop a deep understanding of one’s body, mind, energy and the spiritual aspects of life. Pure Yoga aims to share simple yet profound yogic tools to enrich a wide range of people’s lives, from those looking to gain better health to those wanting to transform their current situation. The teachings come from a strong platform of empowered knowledge reflecting pragmatic wisdom. The goals are to instruct, guide and mentor – to get alongside people, tune in to what they need and allow them a grounded, supportive space to transform in a natural way. Yoga classes aim to strike the perfect balance of traditional yogic knowledge to modern form, helping you apply thousands of years of ancient insight to your everyday life. The Bihar School of Yoga, also known as Satyananda Yoga, emerged directly from thousands of years of yoga tradition in India. The essence of this tradition was adapted and transmitted for the modern times through the life’s work of Swami Sivananda Saraswati and Swami Satyananda Saraswati along with that of other great yogis. This internationally renowned system of integral Yoga focuses on harmonising the mind, body, and emotions. It is a systematic approach to self-transformation, grounded in both ancient practices and modern science. It draws on the wisdom teachings and classic texts of Hatha Yoga, Raja Yoga, Kriya Yoga, Karma Yoga and Jnana Yoga, Bhakti Yoga and others. · Meditation – systematic, guided, grounded. · Mantra chanting – for healing, developing your voice and as a dynamic form of meditation. · Havan – Vedic fire ritual for health and healing through mantra chanting. · Kirtan – The yoga of sound and vibration to uplift, inspire and connect. Learn more about my Yoga courses and Events or connect with me on social media. Every day brings fresh opportunities to embrace the discovery of inner wisdom. As an educator, teacher, mentor and practitioner, it’s my privilege to guide people through their own personal exploration of how Yoga can transform lives. 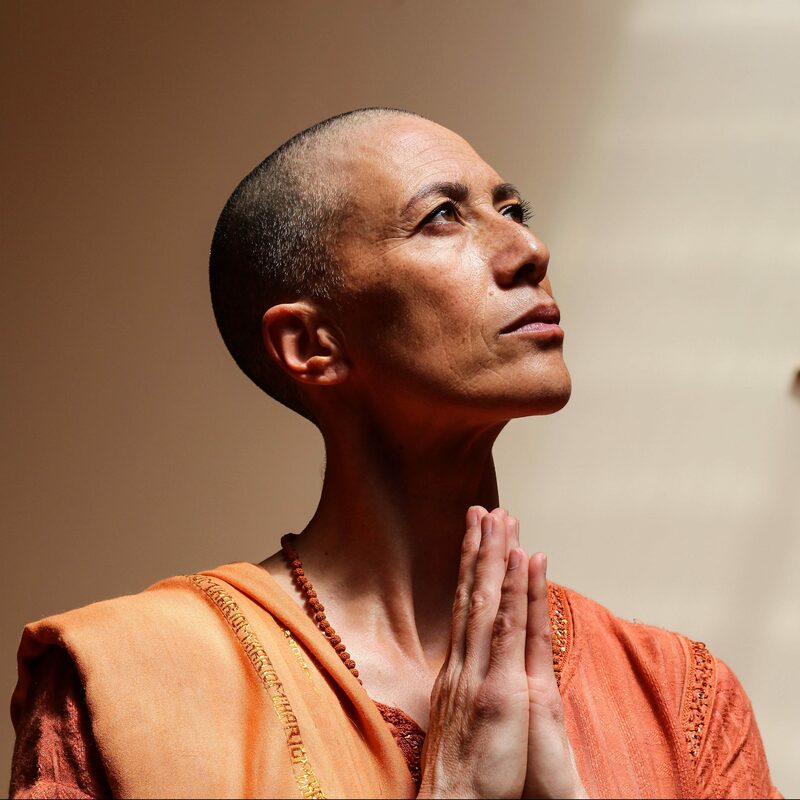 Sannyasi Pragyadhara has instructed and lectured on the Yogic studies and Yoga Teacher Training courses at the Satyananda Yoga Academy, Australia and at the Bihar School of Yoga, India. In 2013 she toured different states in India as part of the all-India Yoga Yatra conducted by Bihar School of Yoga and held seminars in Delhi, Kolkata and other states. She has conducted immersion retreats and yogic trainings in China, Australia and in New Zealand. Like to know more? Let’s connect!